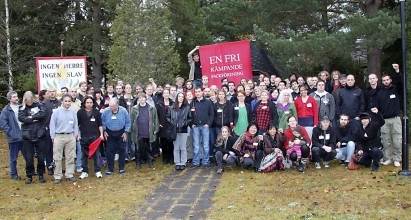 A new statement of principles which was adopted by the Swedish syndicalist union SAC (Central Organisation of Swedish Workers) on the first day of its 29th Congress, held in October 2009. 1. THE WORKERS OF THE WORLD are exploited in the capitalist profit-driven system of production. Under capitalism, the means of production have been monopolized by a few. They have therefore the social power to acquire all the wealth created. At the same time we, the overwhelming majority, are forced to work without power over the business, and for a wage which does not correspond to the value of what we produce. Where capitalism is allowed free range, violence and destruction are following in its wake, as well as a ruthless exploitation of natural resources that threatens the human environment and living conditions worldwide. From these circumstances arises the class struggle, in which the workers can only rely on their own actions. 2. SYNDICALISM is not primarily an ideology but a tradition of struggle among workers. We are driven by our desire for freedom and socialism. We nourish a dream that one day we will put an end to wage slavery. By building up industrial workers' organizations, with the workplace as a starting point, we can mitigate the effects of capital's exploitation and the state's coercion, in order to finally overcome this inhumane economic and political system which gives all the good things in life to the exploiters. 3. DESPITE THAT THE WORKING CLASS today, as well as in history, is layered and fragmented in many ways, for example by industry, trade, legal status, gender, ethnicity, age, and employment status, SAC thinks that all workers have basic common interests. Therefore, the SAC consists of Local Union Confederation (LS) that organize all workers regardless of trade. As all workers have common interests, an organization that brings together all workers are needed. Through our organization we combat divisions within the working class and increase our collective power. If we are to hold together as workers, this requires us to act in solidarity. SAC understands solidarity as a common struggle for common interests. 4. THE EXPLOITATION OF THE WORKING CLASS takes different forms depending on where in the social hierarchy the work or workers are located. Heavily exploited groups of workers are employed to lower the standards of more established workers' groups and migrants and the unemployed are used to press down wages. Women's work is often valued less than men's. This affects the workers' mutual relationships in the workplace and creates tensions within the working class. The interests of heavily exploited group must be given decisive impact in the fight. No form of discrimination or subordination can be tolerated. SAC is a feminist and anti-racist organization. 5. IN SAC, WE BELIEVE unreservedly in the working class', that is, our own, strength and skills. We do not need the blessing of power to give legitimacy to our fight or justify our existence. We know that neither libertarian socialism nor organization will be possible if we do not believe in our own ability. SAC believes that the workers must organize themselves free from any outside interests, like those expressed by the state and employers. SAC is an anti-authoritarian organization and sees direct action as the means to change society and our living and working conditions. 6. OUR POWER IS BASED on the way we organize ourselves. For a union to achieve maximum impact, it must be free from any interests outside of their members. In order to achieve maximum impact, the union must be organized in a federalist manner, which means self-determination in own affairs and cooperation on common issues. Centralism, bureaucracy, and other authoritarian forms of organization weakens unions. Our inner strength is derived from the principle that those affected by a decision should also be those who have taken it, and that all elected representatives are directly recallable. To avoid division in the workplace, and between trades, a powerful union must be organized industrially. Unions organized by trade are an anachronism. A powerful union must further more have the will to fight. A powerful trade union must also have the ambition to win their battles. 7. IN THE PRODUCTION OF GOODS and services, the workers have the power needed to change society. The social power of the working class is latent in the production process. Therefore the workplace is our premier venue for organizing. The labor market which provides the framework for the workplace struggle, must also be an arena of battle. 8. WE WORKERS HAVE NO FATHERLAND, our living conditions are intertwined with our sisters and brothers throughout the world. Global solidarity is a prerequisite for the liberation of the working class. SAC is opposed to all violence used by governmental and supranational institutions, as well as paramilitary groups, in order to maintain capital's world order. SAC believes that workers always have the right to defend themselves against such violence. 9. SAC'S GOAL IS libertarian socialism: a society that is no longer divided into ruling and dominated classes; a society that no longer consists of exploiters and exploited; a society free from state coercion. In libertarian socialism, production is governed by society's needs, which gives work meaning. The workers control the organizing of production, which gives the work content. 10. WE HAVE A BIG TASK ahead of us. But we know we can organize and win victories. We are fighting on our own merits, we struggle where we live our lives, that is as simple and as obvious as that. Only thus can we develop the self-responsibility that is the foundation of free socialism.